I've been drooling over the promo pictures for these since I first saw them months ago and now they're finally here! It's a great collection and isn't a whole lot like what the promo pics suggest. As always, click the images to view full size. A Ruby For Rudolph. WOW! Sparkly!! As you can see in the bottle, there's even a tiny hint of gold in it. Baby It's Coal Outside. Sparkly charcoal black. Very pretty, but could also be a twin to Misa Wishing On A Star. Don't Toy With Me. Really truly gorgeous. It's a deep magenta-red with lots of shimmer. Reminds me heavily of OPI Merry Merry. Girls Just Want To Play. A bright, summery red along the same lines as OPI Cajun Shrimp and OPI My Chihuahua Bites. So bright it almost glows. Glamour Game. Unique silver/peach metallic duochrome with little flecks of shimmer. This is one of those streaky metallics and I had a difficult time applying it. Little Red Wagon. Smooth and flawless berry red creme. A little more muted and fall-like. Play Til Midnight. Or is it Russian Navy? It's a deep blue shimmer with little speckles of purple and red shimmer. Red Hot Gift. Bright true red creme. Definitely red hot! Rosy Mistle-toesies. Shimmery rosy red, almost a little frosty. "Sheer" Your Toys. Weird name, cause it's not sheer at all. A strange color- metallic grey silver with copper glitter. It's like Gone Platinum In 60 Seconds with a handful of penny colored sparkles. You're A Doll. Another strange color- greyed pinky peach with copper glitter. This one's like Rescue Beauty Lounge Grunge with the same copper glitter as "Sheer" Your Toys. I'm missing Brand New Skates, but as soon as I get that one I'll add it here. These don't really scream 'holiday' to me... Some of them are even quite summery! However, every single one is gorgeous and the copper glitter is something I haven't seen before. Two thumbs up from me! I agree, none of these seem to "scream" christmas to me either. A couple of the reds were ok, but to me thats about it, I think. I most like this collection. i put my eyes on it not long tome ago. Beautiful swatches as always! I agree with your review wholeheartedly. I bought Brand New Skates, which I love, so I am looking forward to hearing what you thought of it. It is going to be one of my "go to" colours through the winter. Thanks to you and the other lovely bloggers, my stash is now at about 70 bottles :). I love the Hot Red Gift, Little Red Wagon and Girls Just Want to Play. Those are the only ones that appeal to me. As always, your swatches are beautiful!! 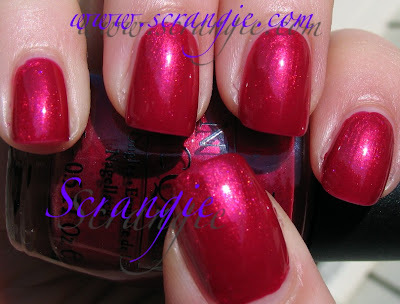 I'm loving the reds, particulary the shimmers (I want them all! ), but how many reds does one need? lol BTW, did you get A Ruby For Rudolph? Lovely swatches scrangie! Need Red Wagon! Sorry, I forgot to ask this in my previous post. 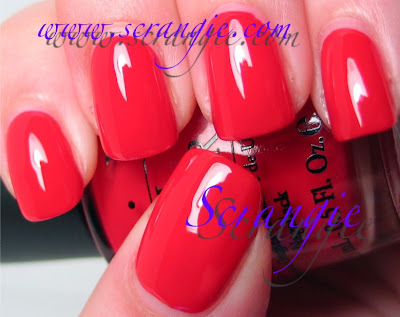 How similar would you say are OPI Don't Toy With Me and China Glaze Ruby Pumps? Why did I have to come here and see this post? I have resisted and now I might just break. I'm wearing "Sheer" Your Toys right now and I haven't been able to stop looking at my hands for the past two days I've had it on. Such a pretty color. I also have You're A Doll but I haven't done a mani with it yet. I like the reddish glitter in both of those. Very unique. Can't wait to get Brand New Skates. It looks beautiful from the other pics I've seen. Thanks for swatching! Glamour Game and You're a Doll are really calling to me. I've got a thing for muted pinky-peachy nudes this year. I've already gotten the Sally Hansel Salon in Divinity, but the copper shimmer is calling me. Can you swatch some of the muted pinky nudes sometime? Or have you done it, and I missed it? i LOVE this collection!!! have been waiting forever for it to come out ever since i saw swatches of it! Ordered 8 out of the whole collection and i'm tinking of adding another 2 more OMG!! Thanks for these pics Scrangie! I am going to get five of these. I don't know why but I love Sheer Your Toys and You're a Doll. The copper flecks look unique.